You may recall that last year Meredithe and Anne came up with the idea of managing “Significant Progress” on six old projects or Works In Slow Progress, with room for six entirely new ones – because we all know how easy it is to be completely knocked for a loop by a shiny new project or sudden obsession with a new technique! – and have called the project “6 and 6 in 2018“. It was extended to add “6 Yarny Things”, halfway through the year. Again, I wasn’t very organised about posting updates, but I have at least managed to do a round-up of the year. 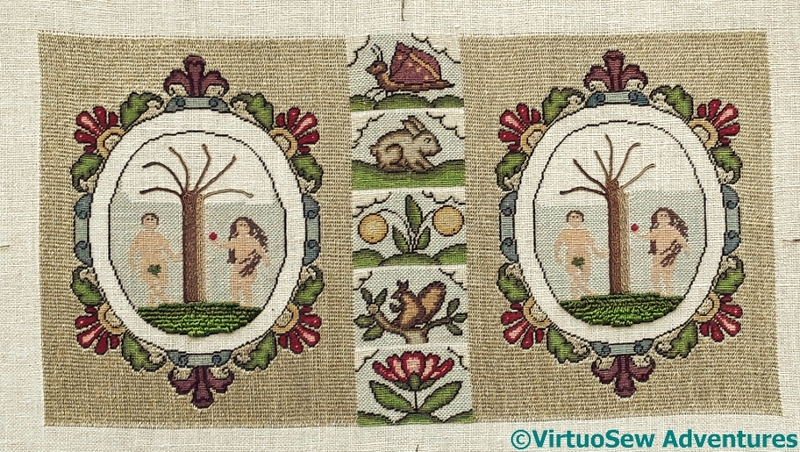 Eve in the Garden of Eden is finished, and so is the Amarna Backpack! 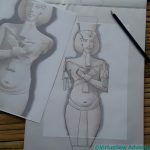 Akhenaten has moved on significantly, and with a few reservations about detail and solving a few last little problems, I’m very pleased with him indeed. 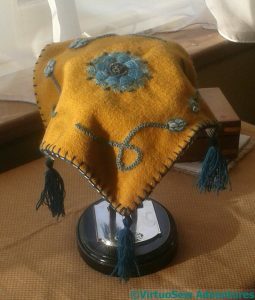 Of course, there was the little magnifier cover (finished), which was a vaguely StitchOff-inspired piece worked last Christmas and New Year. 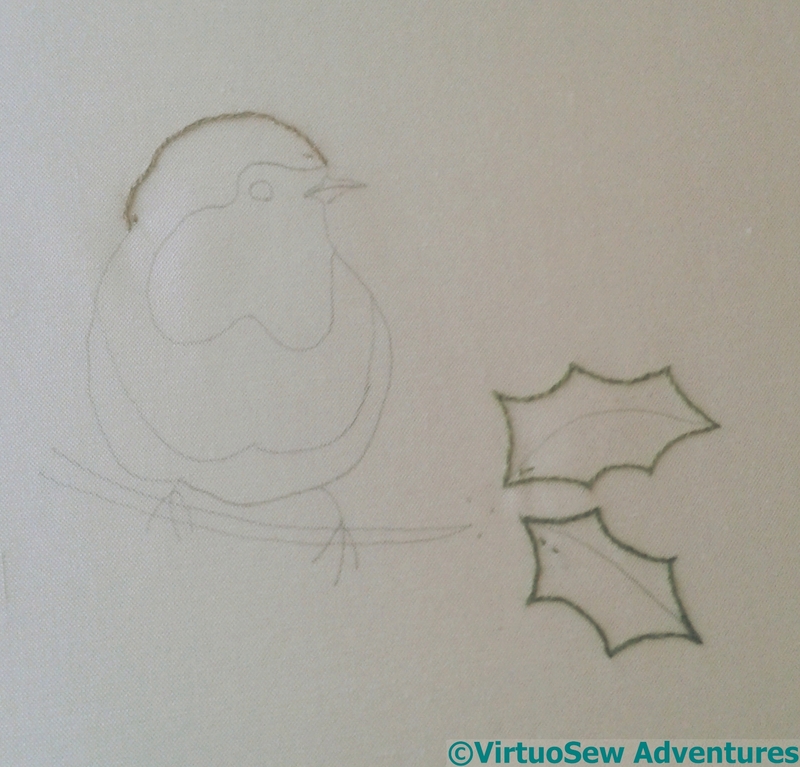 Then there was the little Robin. 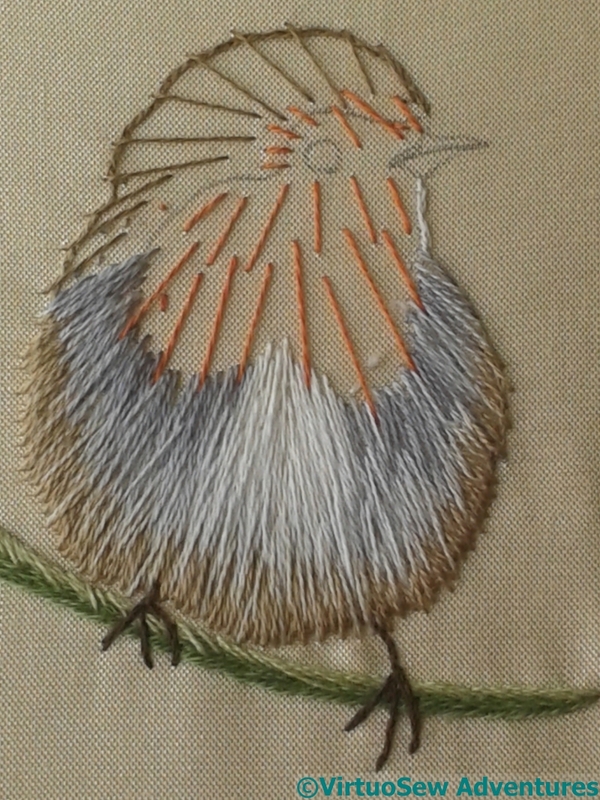 I’ve not finished him into something yet, but I enjoyed working him, and I have become a little more comfortable with silk shading! And, of course, there was “Leaving The Tyne, 1915“, which was a very intense, and very long-running project, which, if I say so myself, was finished triumphantly in advance of deadline, and formed part of the display in Liverpool Cathedral. And finally, the Yarny Things. These are a shawl, a cape, and three berets. There’s another beret somewhere, and a pair of socks. That’s seven! 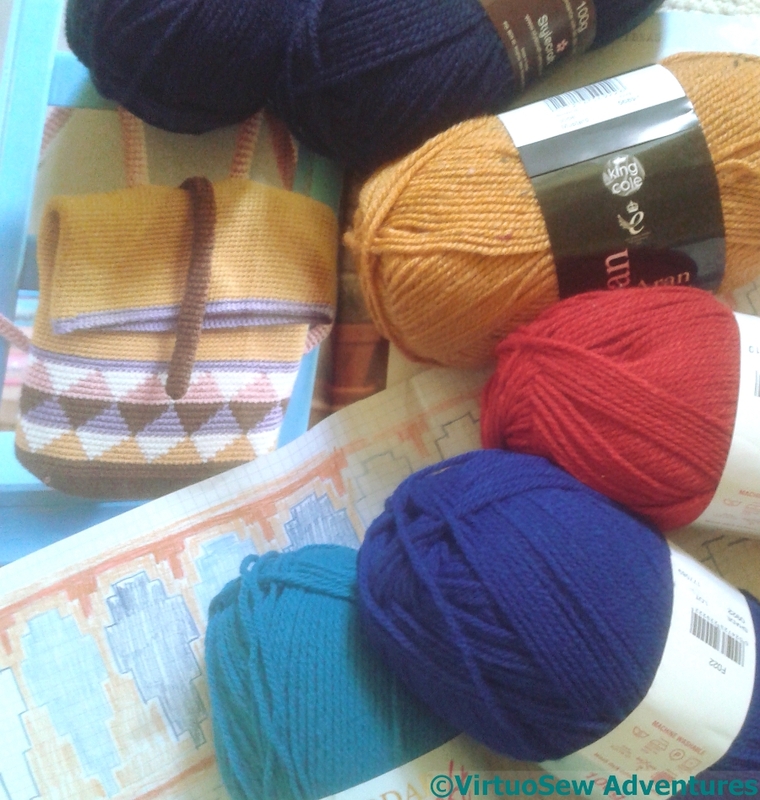 I’ve also started on a Moebius Shawl, and another pair of socks…. 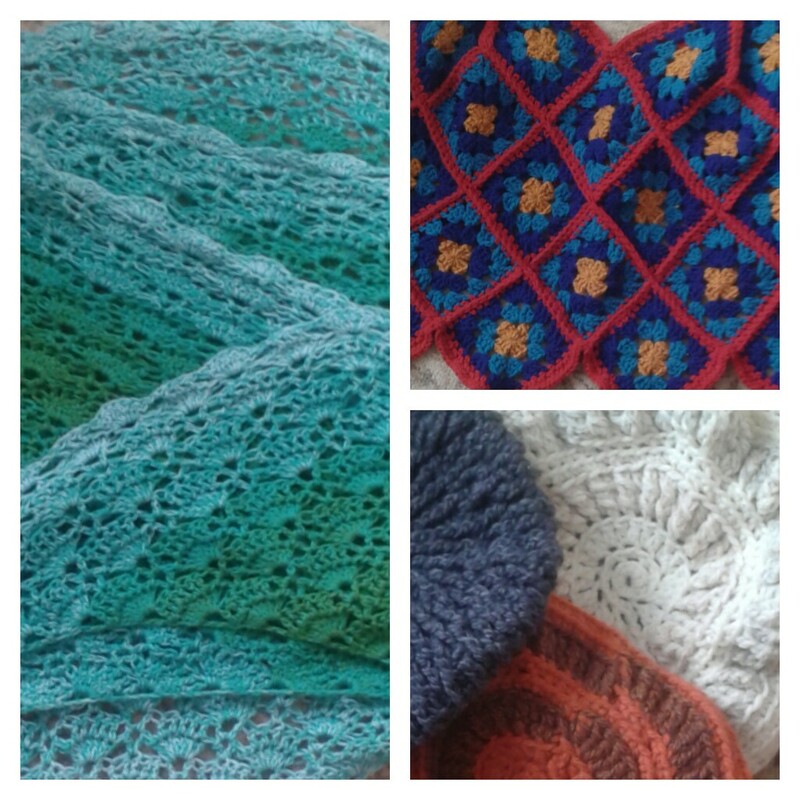 It’s just possible that I’ve taken to crochet more than I might have expected to! My word, it’s taken a long time! 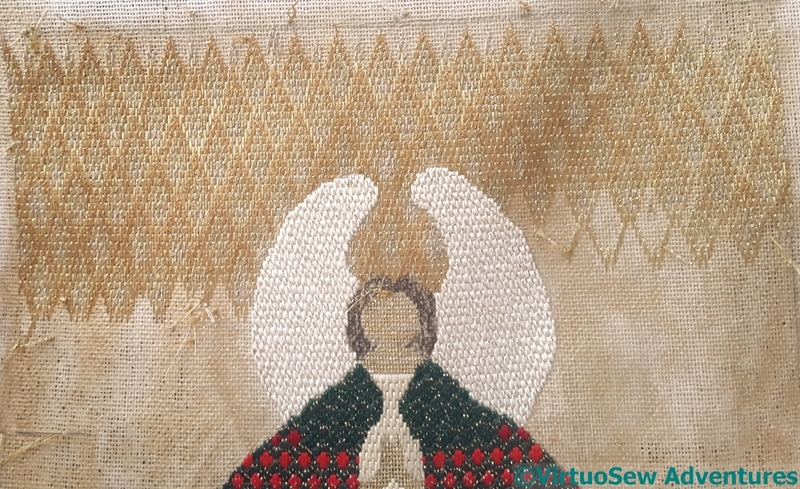 I started it in November 2015, and it took nearly a year just to finish the tent stitch, and then about eight months to do the gold Elizabethan Ground Stitch. Progress wasn’t helped, of course, by the fact that counted work is something I can only do in short spurts. Or by the number of times I got distracted by wonderful new ideas I simply had to bring to life! 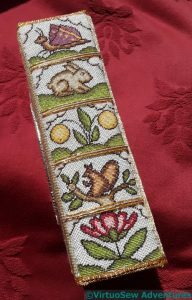 However, once I had got to the end of the stitching, and then the goldwork (isn’t it gorgeous, by the way – do click to zoom in on the photos! 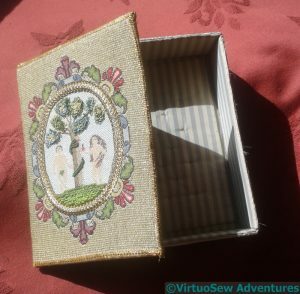 ), there was a whole new level of puzzling to do, cutting out and assembling the lining for the box and then the box itself. What with layers of padding and card, and the lining (silk, of course!) 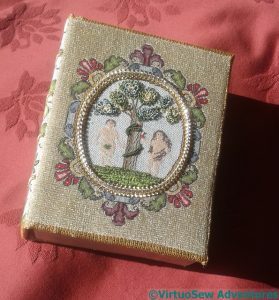 and the (silk) brocade covers for the outside of the box, there was a lot of pre-assembly to do, since the padding and lining, and the padding and external cover all had to be sewn together before the final assembly. That final assembly was fiddly in the extreme, but is now finally complete. I’m going to wrap it up and hide it for a few weeks until the pain is merely a memory, and then find somewhere to put it and gloat, because I am very pleased with it. Just a bit sore from wrestling with sharp needles and too many layers! I have to admit that I have enjoyed the little Robin. 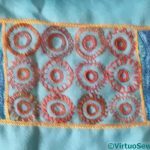 Here is a halfway point, showing that while many suggest drawing direction lines for their stitches, I chose to draw with my needle instead. I found that the more helpful because it gave me a chance to gauge the overlap of each section with the next. 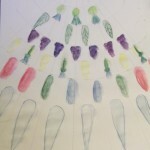 I’ve gathered that some tutors suggest working small sections to completion, and others in colour layers. I took the latter approach with the (I’m sure not original) refinement that sometimes I went back and did another layer in a colour I’d already done. 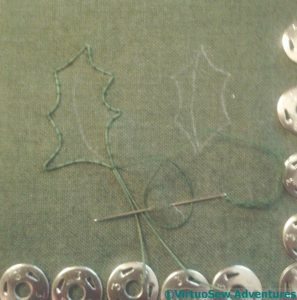 I also had fun with the stumpwork elements: two simple wired leaves (nothing terrifying about that, after working on the Stumpwork Violets for Dreams of Amarna!) 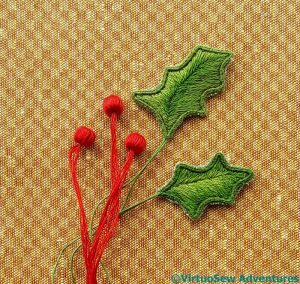 and three berries made of beads wrapped with thread. I’ve not wrapped beads before, but as it turned out, this, too, turned out to be fairly straightforward. 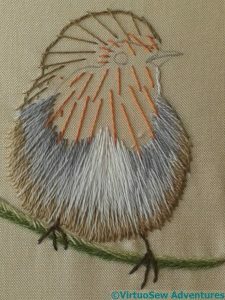 As you can see, even though I worked him in a hoop, and regularly made sure the fabric tension was maintained, there is a little bit of puckering. That may reflect, as much as anything else, a certain anxiety on my part. 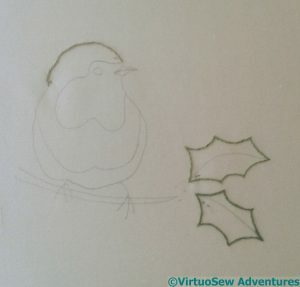 I think I will mount him on a round card and add him to the winter decoration corner when I set it up, and I should be able to ease some of the puckering then. 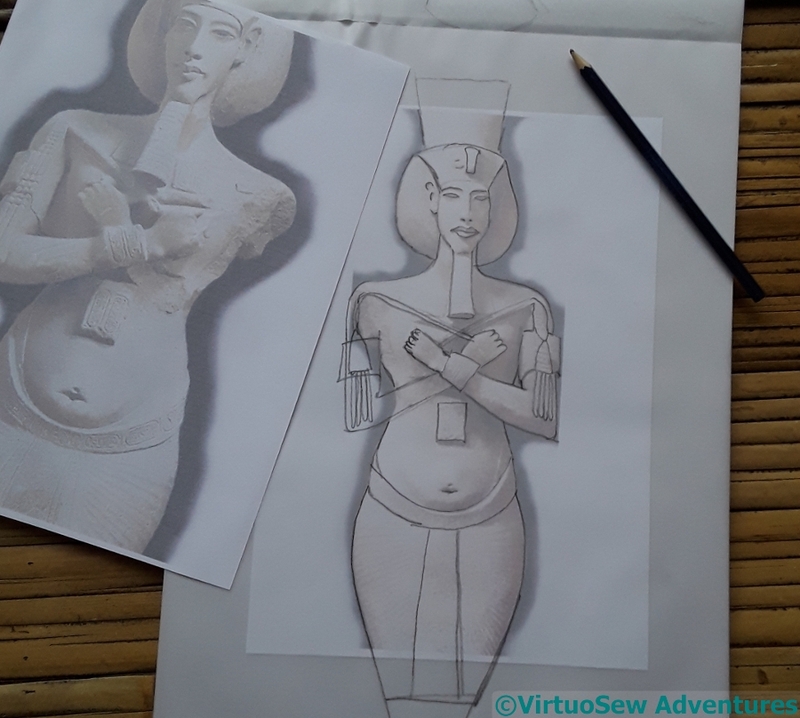 And – for those enquiring minds that wish to know – while I can’t say I’ve fallen in love with silk shading, we are definitely on better terms than we were! 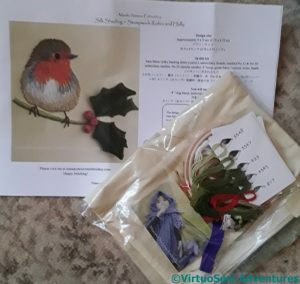 In this case, I am expressing my good fortune in having a family that takes my embroidery as seriously as I do – and the gritted teeth are because my parents elected to give me a learning opportunity for Christmas. Silk shading is something I know I should work at, but would be most unlikely to choose to do, because the naturalistic representation it tends to be used for is not really my forte. All the more reason, of course, to make an attempt, at least, to get to grips with it, but I haven’t been able to convince myself to do so! That said, Masako Newton‘s Silk Shading and Stumpwork Robin and Holly is really very sweet indeed, and I am sure I will enjoy working it. Furthermore, unlike the Jane Rainbow kit my parents gave me for Christmas twenty years ago, there’s no chance of this one being finished quickly. I will certainly learn a great deal from doing the Robin, and he is going to be classed as one of my New projects for 6 and 6 in 2018. 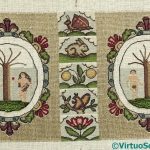 When I read the post on Meredithe’s blog for the March round up of the “6 and 6 in 2018” project, I thought maybe I should do my own. More especially, as I do indeed have progress to report! 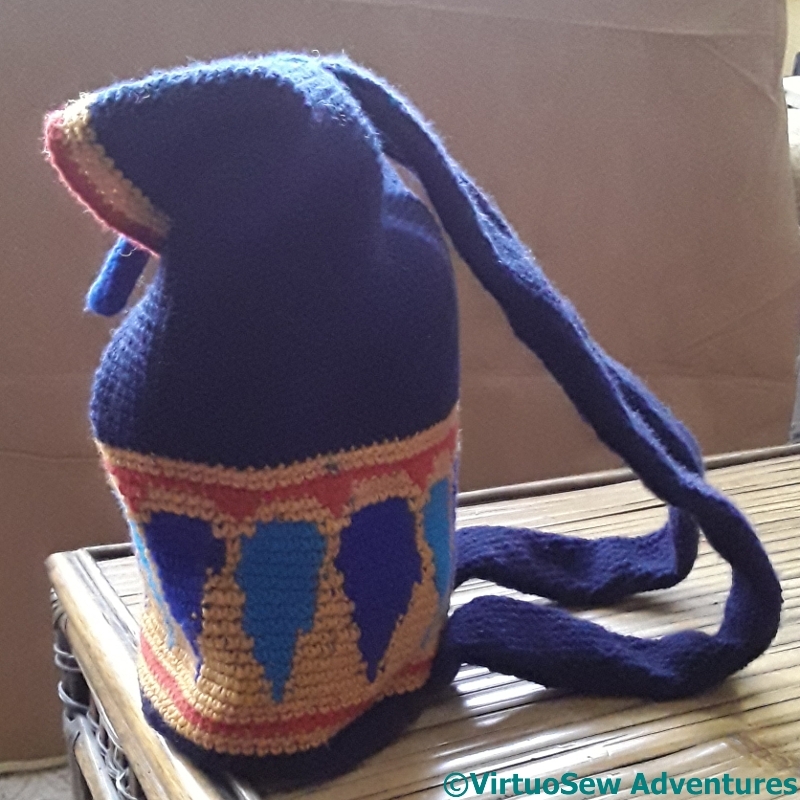 One definite advance this year is that the Amarna backpack is finished. After the straps were attached, it had a very brief trial outing. 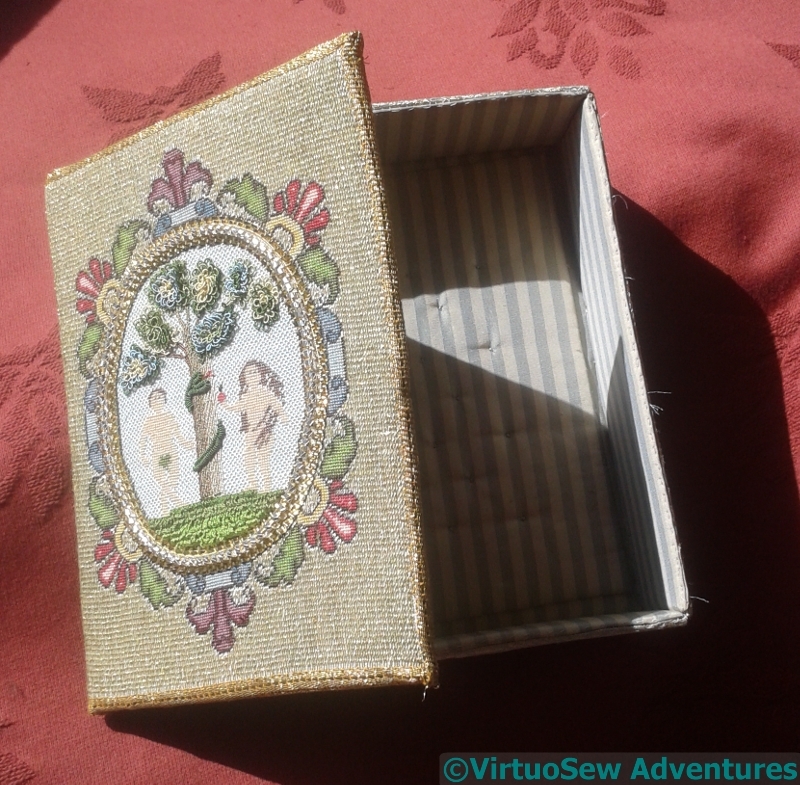 After which, I decided it needed a lining (a lovely sandy coloured printed cotton) and a zip. The zip was something of a struggle to install, but I managed in the end, and the backpack had its first real outing when I took it with me to “Sewing for Pleasure” in Birmingham. 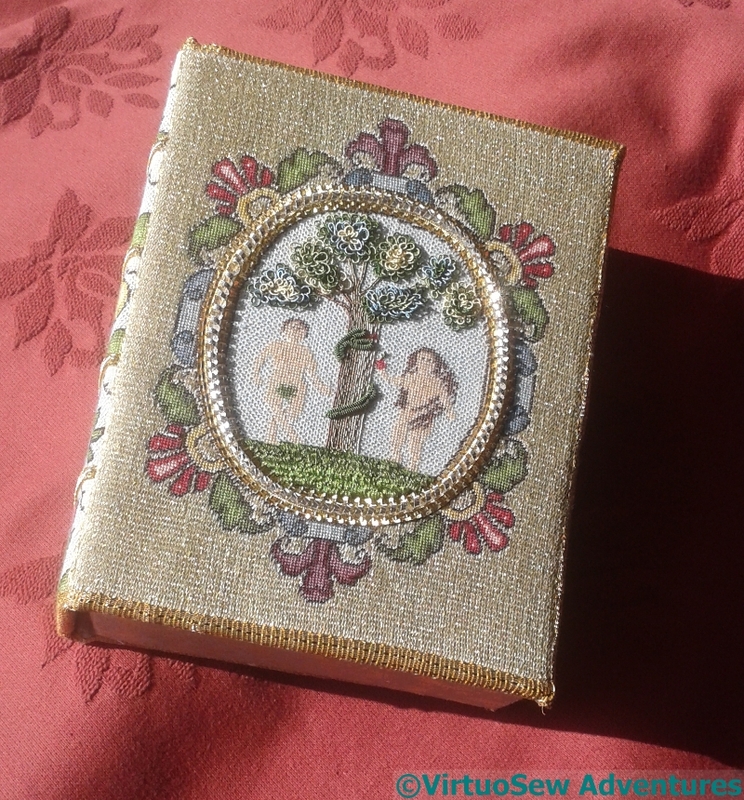 I’ve started to make progress on Eve in the Garden of Eden as well. 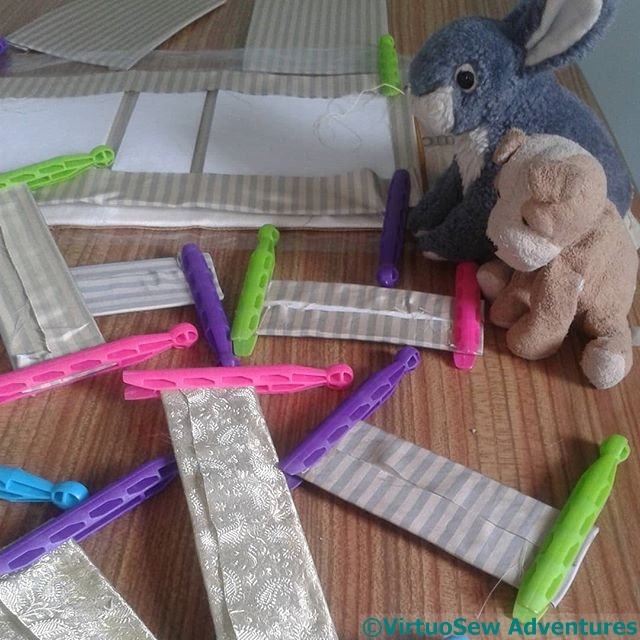 Regular readers know that I’m very uncomfortable with using glue near fabric – or indeed, at all! However, my friends Small Rachel and Harry The Hound of the Doleful Countenance came to supervise and encourage, and remind me to take it slow and steady. And the reminders paid off. The glueing is done, and the next phase involves quite a lot of sewing. The box sides are made of an outer and an inner, and while each of those is glued on the back, in the case of the lining over some padding, the outer and the inner are sewn together. Again, this is happening bit by bit. 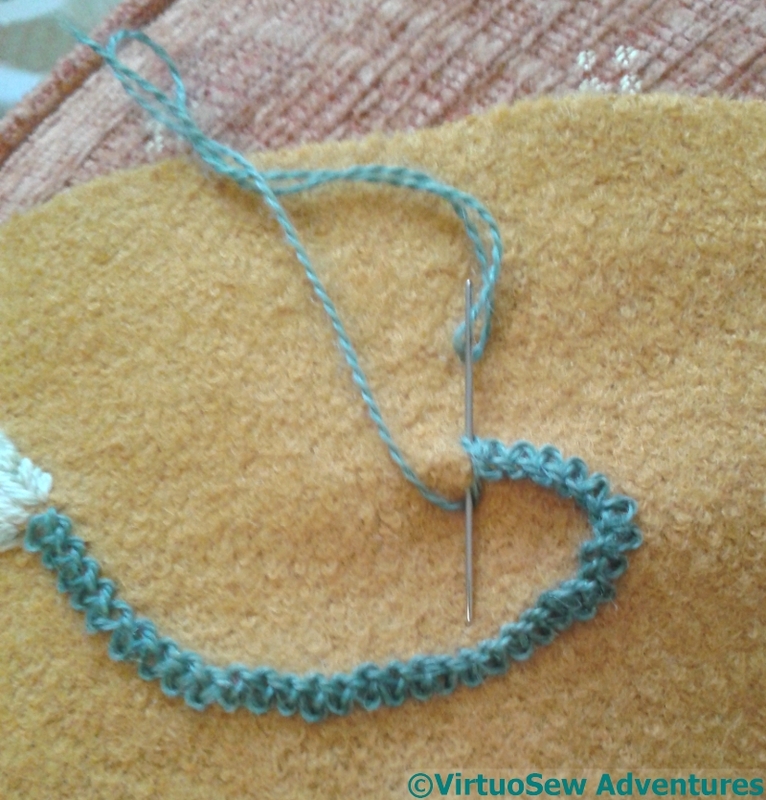 It’s concentrated and fiddly work, and I couldn’t yet sit down and expect to finish it in a sitting. But the glueing is done! 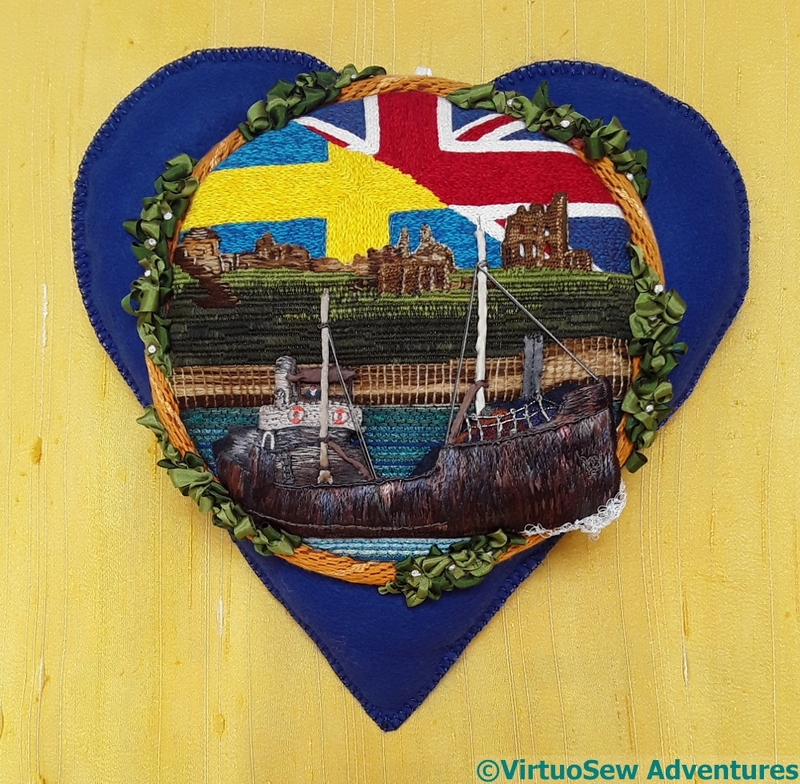 As for new projects, so far there is the cover for Maggie the Magnifier, a Learning Opportunity, and of course the Embroiderers Guild 100 Hearts piece. So watch this space, there will be more! 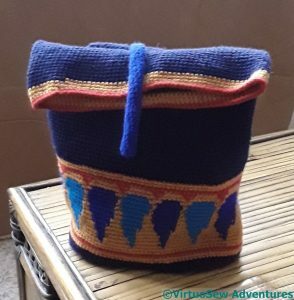 I rejoice to report that the Amarna Backpack is finished! Well, nearly. It is in want of a lining, and it needs a weight in the end of the strap that weighs down the top.. But I have finished and assembled the bag itself, and in the process I have learnt that I am not keen on constricted tubes of crochet – so not keen that I ended up doing broader tubes. They might have taken more yarn, but they involved less muttering! 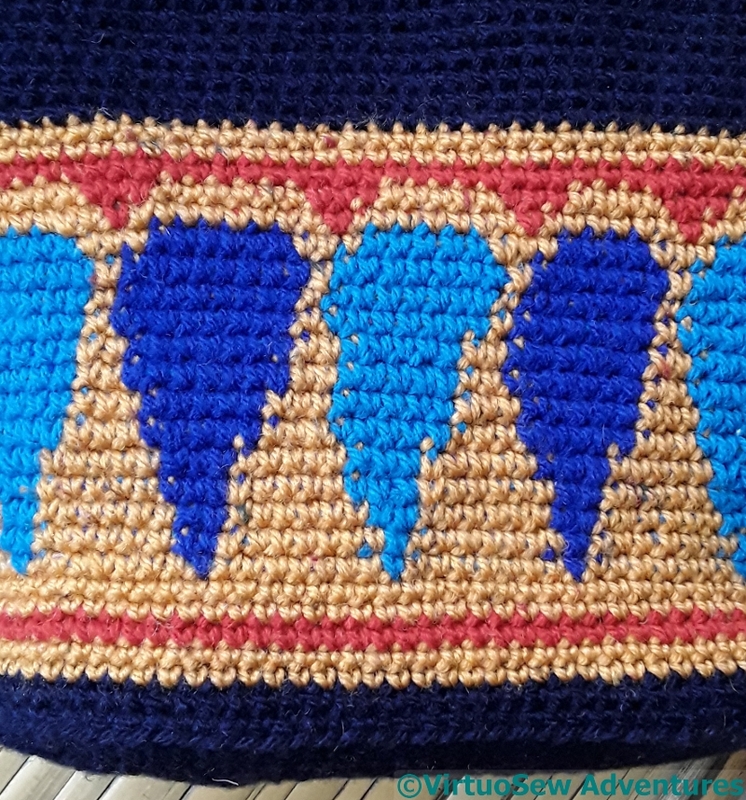 The pattern worked out rather well, I think. It is deeper than the pattern in the magazine, and more complex, because the main section involves three colours in each row. 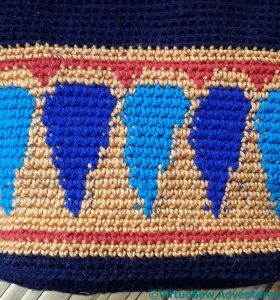 The three yarns tangled constantly while I was working this section, and the pattern hasn’t quite turned out as neatly or as evenly as I might have hoped, but I am still rather pleased that it is genuinely reminiscent of the inspiration! I went to the knitting shop where I bought the materials just before Christmas, to buy materials for another project, and was highly entertained to find that I am there known as “The Egyptian Bag Lady”, because the project intrigued them so much. So next time I go, I must remember to take the backpack with me so they can see it. The embroidery on the new cover for Maggie The Magnifier is relatively simple, but it does involve a few favourite stitches. First and foremost, Braid Stitch. Not the Infamous Plaited Braid Stitch – I was sure I wouldn’t have enough wool for that! – but the ordinary Braid Stitch. I’ve been fond of it for years, as it makes a good, strongly textured line, and it’s much easier than it looks. 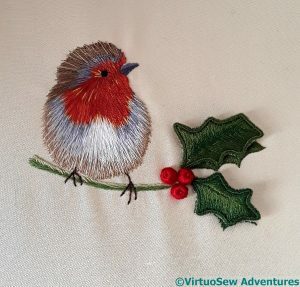 It’s also fairly easy to work in the hand, and this was very much a holiday period project, using bits and pieces I could easily get hold of, which didn’t include my embroidery hoops! 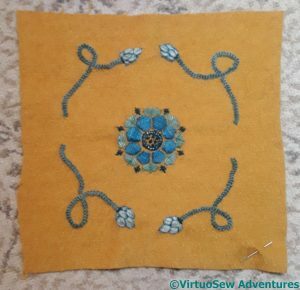 The central rosette uses satin stitch (not a favourite, exactly, but very effective! 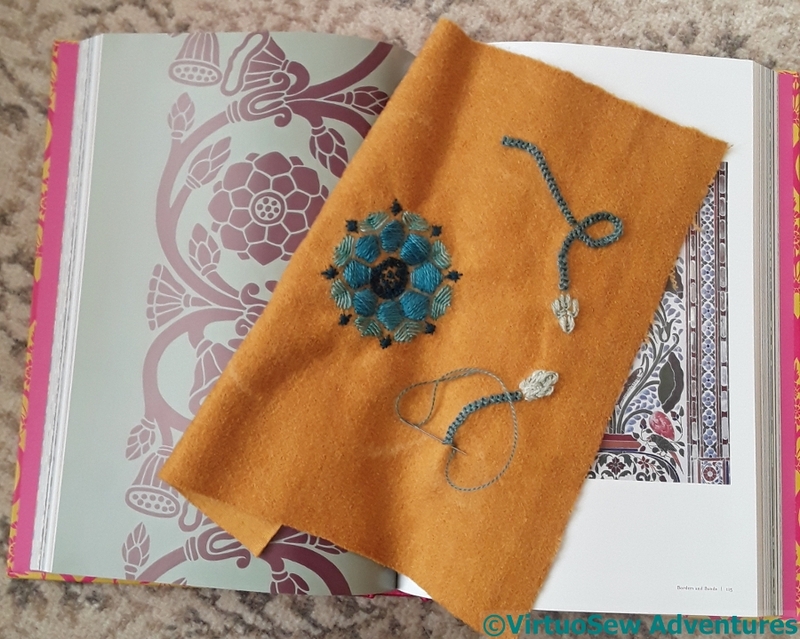 ), Romanian Stitch, and in the centre, a little knotted stitch that I’m sure I know from a book, and has a name, but it just came swimming up out of my head, unattributed, as though I was making it up as I went along. 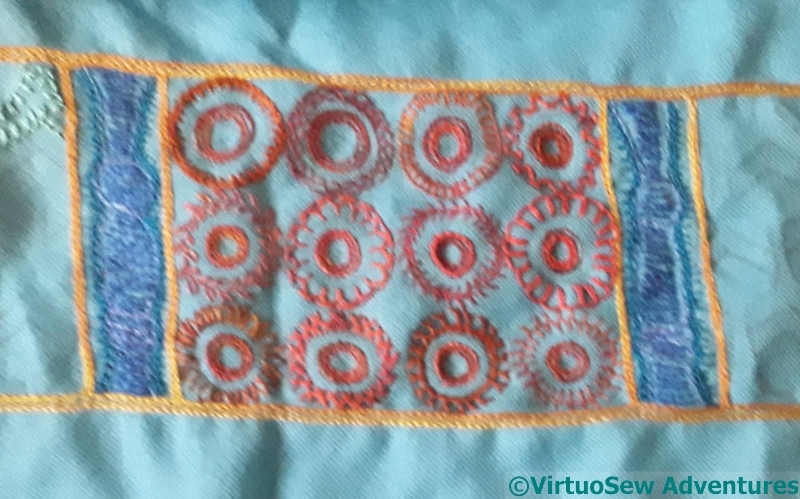 The buds, or finials, or whatever they are, are in nested fly stitches, outlined with further fly stitches, and you will note, from this view, that I stuck to my decision to draft the design by hand, and not tweak and even it up. 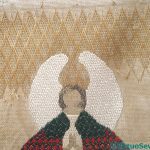 This is very much a piece of domestic, informal embroidery, and there’s no reason for it to look glossy and machine made. 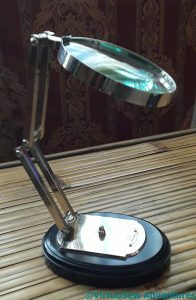 Meet Maggie the Magnifier, so called to distinguish her from Jenny the Jensen Magnifier Light. Maggie was a Christmas present from my cousin. She’s wonderfully sturdy, with a nice heavy base, and notwithstanding the base mentions 1815, we think that was the foundation of the company, and Maggie herself is probably from the 1920s. She will be very useful for details and work at the table, rather than at my embroidery frame, but she needs a cover, both to keep the dust off, and to stop her setting fire to things on those rare occasions when the sun comes out. 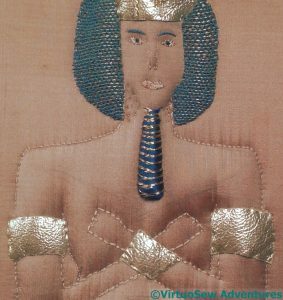 Making the cover seemed a good way to pass the time over the period when I had Akhenaten hidden away, so I used a piece of brushed bouclé fabric and some rather lovely wool thread I got from somewhere-but-I-can’t-remember-where. Since I did the Great Lady’s Magazine Stitch Off, I’ve become very conscious of what I learnt that I didn’t anticipate – becoming aware of how much more often an embroiderer of that period would have reckoned that Close Enough Is Good Enough, how often a pattern would have been sketched on by eye, rather than prick-&-pounced for precision, how much effect and speed would have trumped detail. I’m trying to apply that myself – when I don’t need exactitude, I don’t intend to strive for it. I hope it will make fun new projects more fun, and more “free”. This is a perfect candidate for that approach. The basis of the design is a floral pattern from a rather gorgeous book called “Pattern and Ornament in the Arts of India”, with curlicues in the corners of the square of fabric. 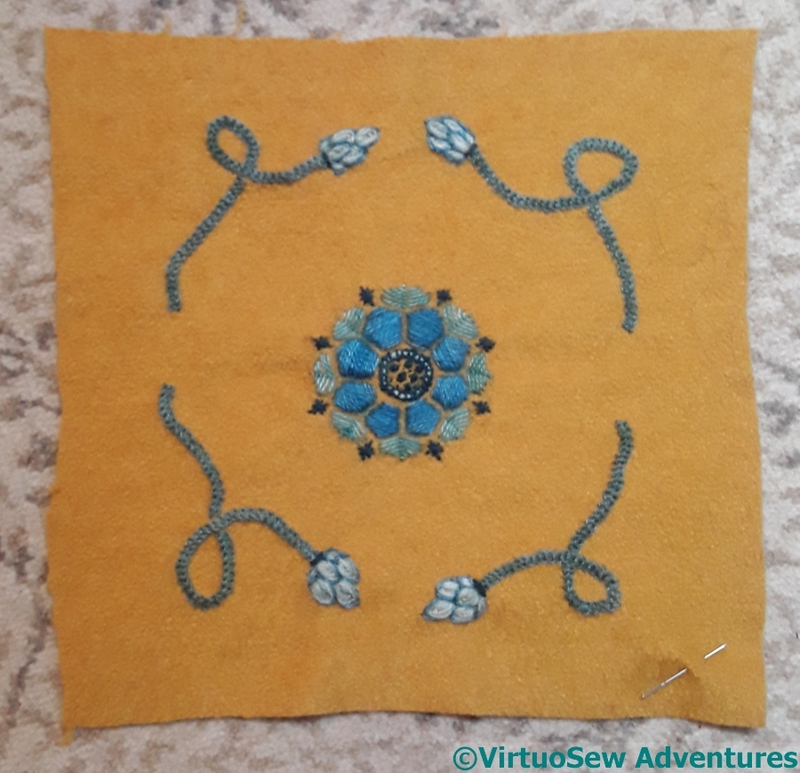 I practiced a couple of times in a notebook, and then simply drew the design in chalk on the fabric and started stitching. This year Meredithe and Anne have come up with the idea of managing “Significant Progress” on six old projects or Works In Slow Progress, with room for six entirely new ones – because we all know how easy it is to be completely knocked for a loop by a shiny new project or sudden obsession with a new technique! – and have called the project “6 and 6 in 2018“. 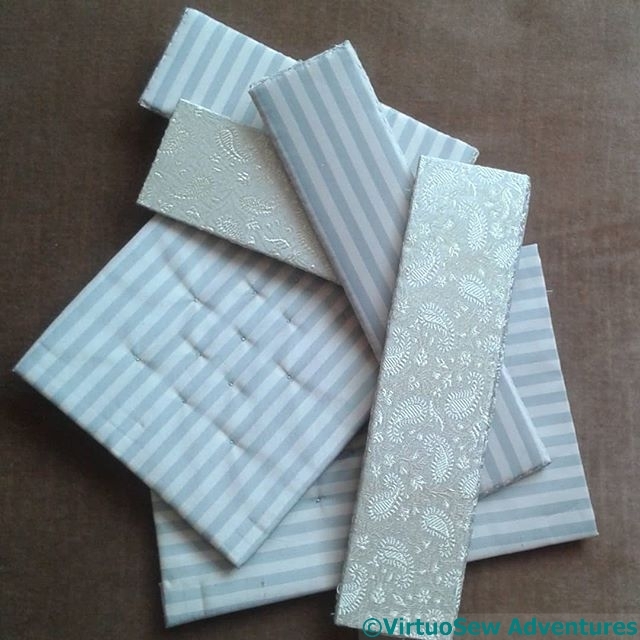 I wasn’t a very organised contributor last year, and I probably won’t be this year, but I do intend to try! First of all, “Eve In The Garden of Eden”. This means constructing and covering the box. That in turn implies the use of glue, which as I’ve mentioned before, makes me very nervous indeed. It will probably take some effort to get up the courage to tackle it at all! Secondly, the Nefertiti Shawl. It’s such a lovely cheerful colour that I want to be able to wear it, which should be incentive enough, wouldn’t you say? 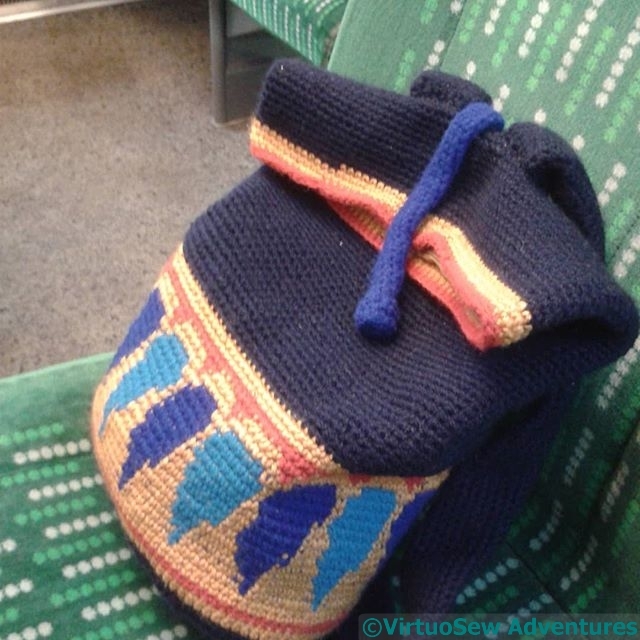 Thirdly, the Amarna Backpack. I’ve made a fair bit of progress here, and I’ve learnt a few useful lessons, but I want it to be useable, and preferably lined, by the middle of the year. Fourth, the Christmas Angel. It really is simply a matter of getting it set up so it is convenient to tackle this one, but of course in terms of work to be done it has strong competition, from number five. Fifth, of course, is Akhenaten. I’ve put him away over Christmas and missed him terribly, so I have a strong feeling that he’s going to send the rest of them to a distant second place! 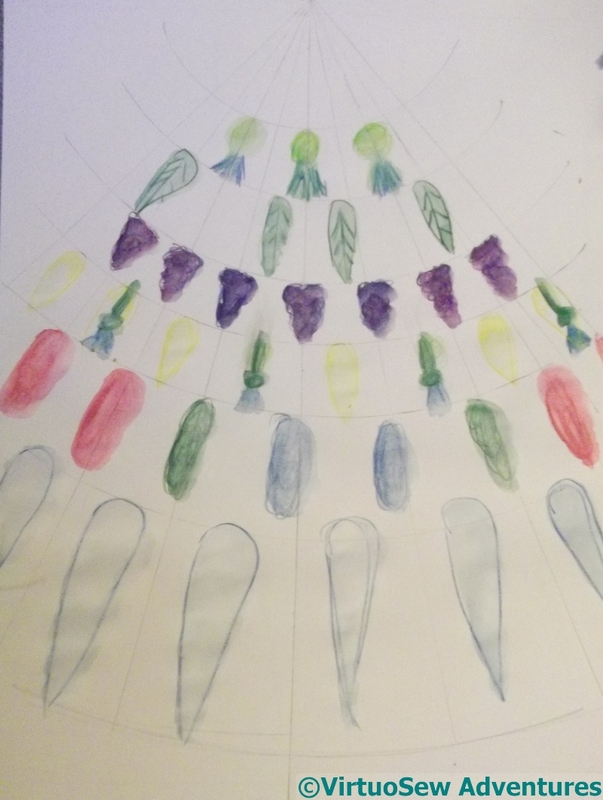 Sixth isn’t really a single project, but rather the crystallisation of ideas which are already bubbling in my head, like the Faience Necklace, and the beginnings of ideas for the Vision of Placidus. There are some that need to be out on paper for the next stage of mulling over. Anything that helps with that will make this year a huge creative success!